PDF files are great for exchanging formatted files across platforms and between folks who don’t use the same software. But sometimes we need to be able to take images or text out of a PDF file and use it in Web pages, word processing documents, PowerPoint presentations, or in desktop publishing software. Depending on your needs and the security options set in the individual PDF there are several ways to do this with the help of PDF Converter for Windows 8. Images and text can be extracted from virtually all PDF files while keeping the image layout and text formatting unchanged. 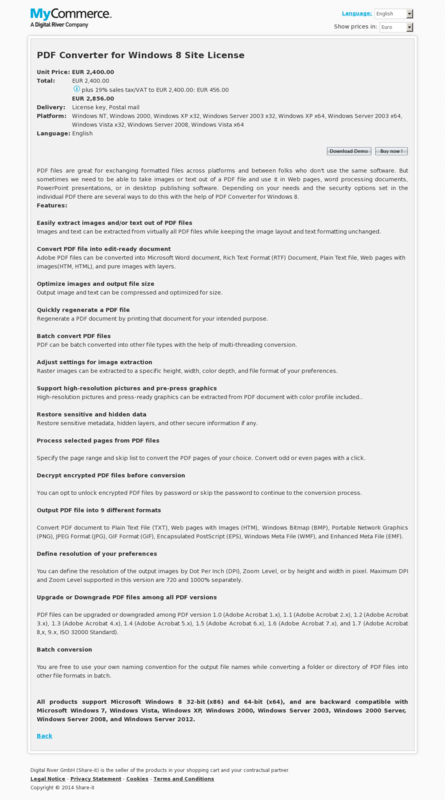 Convert PDF document to Plain Text File (TXT), Web pages with Images (HTM), Windows Bitmap (BMP), Portable Network Graphics (PNG), JPEG Format (JPG), GIF Format (GIF), Encapsulated PostScript (EPS), Windows Meta File (WMF), and Enhanced Meta File (EMF). PDF files can be upgraded or downgraded among PDF version 1.0 (Adobe Acrobat 1.x), 1.1 (Adobe Acrobat 2.x), 1.2 (Adobe Acrobat 3.x), 1.3 (Adobe Acrobat 4.x), 1.4 (Adobe Acrobat 5.x), 1.5 (Adobe Acrobat 6.x), 1.6 (Adobe Acrobat 7.x), and 1.7 (Adobe Acrobat 8,x, 9.x, ISO 32000 Standard).